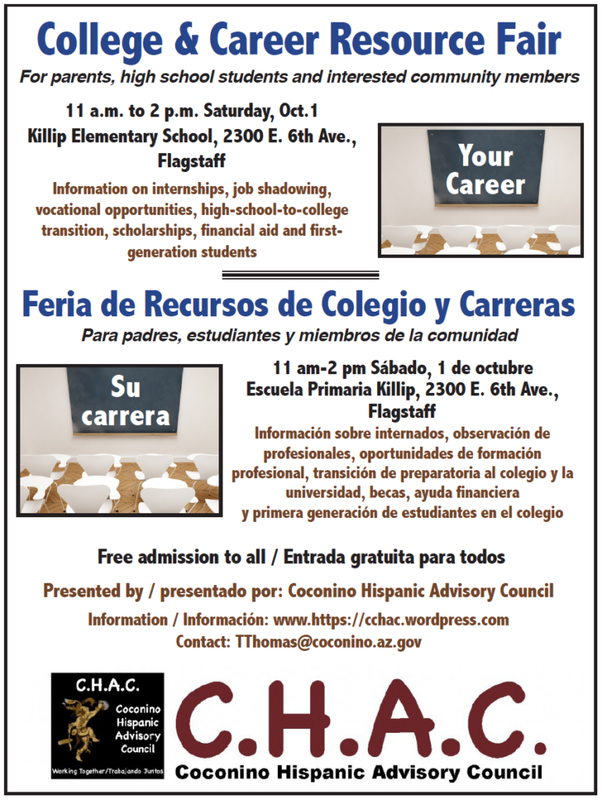 FLAGSTAFF — The Coconino County Hispanic Advisory Council (CHAC) will present its second annual College & Career Resource Fair from 11 a.m. to 2 p.m. Saturday, Oct. 1 at Killip Elementary School, 2300 E. 6th Ave., Flagstaff. The fair, open to parents, high school students and interested community members, will offer information to help area youth prepare for employment, internships, job shadowing and high-school-to-college transition and find financial aid as they prepare for higher education and the next steps needed for their future. Nearly 20 community organizations staffed resource tables at the 2015 event, and provided speakers at informational workshops. Spanish-language translators will be available to help attendees. “Our vision is to inform youth, their families and other community members who may show some interest in attending college either full-time or part-time sometime in the future. We would like to target young persons and their parents who may not know where to find college information. In some instances the parent’s language is a barrier,” stated Ruth Eaton, M.Ed, a member of CHAC. CHAC members include Ruth Eaton, Patricia Garcia, Miguel Vasquez; Frank X. Moraga as chair and Theresa Thomas, executive assistant to Supervisor Elizabeth “Liz” Archuleta. Thomas serves as the liaison to the organization. Organizations seeking to participate should contact Theresa Thomas at tthomas@coconino.az.gov or call (928) 679-7162 for more information.